What’s the Difference between Footed and Unfooted 3-Toed Bowls? This digital PDF file consists of eight (8) pages, one of which is the Cover Page seen to the left. The remaining seven (7) pages show a variety of photos distinguishing the difference between the footed and unfooted variations of the 3-Toed Bowl. Additional photos are also included, along with notes and observations. This report will be a good resource for those collectors that want to know the difference between a footed and unfooted variation of the 3-Toed Bowl. Over the past few months, I have received numerous requests for assistance on what a footed bowl looks like, versus an unfooted bowl. It was obvious that it was time to publish a few photos with detailed information on this very subject. 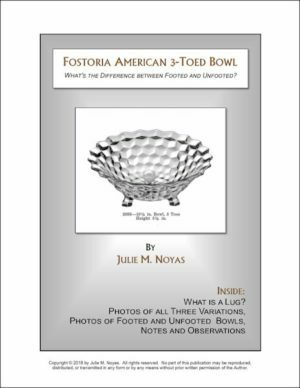 The digital PDF report shows pictures of all three variations of the 3-Toed Bowl – in addition to a photo and explanation of a lug. Once you have reviewed the information, I feel confident you will know the difference between the three variations of the 3-Toed bowl – and most importantly, the difference between footed and unfooted bowls. This report is in English only and is a digital PDF document.